This is an ACA sanctioned event. All participants in ACA-insured activities must wear properly-fitting U.S. Coast Guard-approved lifejackets (Personal Flotation Devices, or PFDs) at all times during on-water activities. Non-HASK participants must sign a waiver. See all rules at the bottom of this page. Participation is subject to approval of the Trip Leaders. This is a 16 mile round-trip paddle on Lake Amistad, the flooded Pecos and Rio Grande RIvers, to a magnificent cave of beautifully preserved rock art that is only accessible from the water. 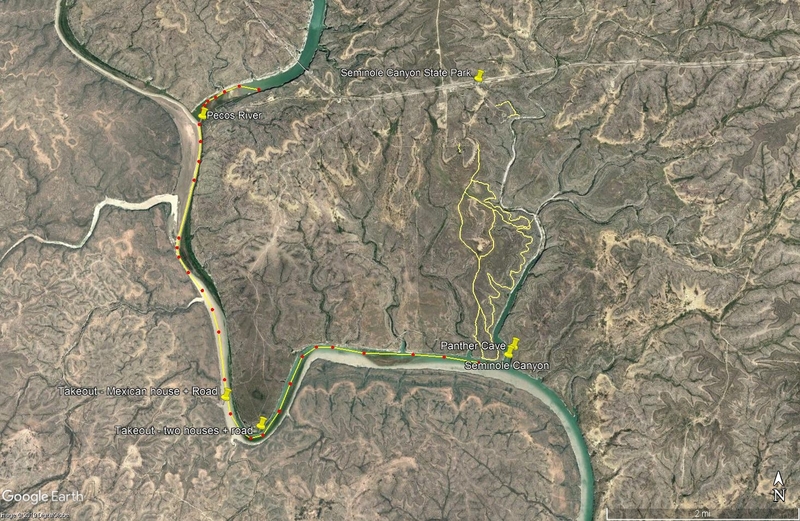 We will put in under the Hwy 90 bridge over the Pecos River, paddle south in the Pecos canyon, then turn southeast into the Rio Grande Canyon to Panther Cave. At the cave, there is a floating steel dock and a grating stair/walkway to the broad opening of the cave. Pictographs are beautifully visible behind a protective wire fence. Participation is subject to approval of the Trip Leaders. This trip is a long Level 2, subject to canyon winds, in a very remote location. In the 8 mile one-way trip, there is only one intermediate point where it is reasonably possible to get out a boat due to cliff walls, cane rushes, and soft mud. Paddlers must be prepared with at least a gallon of water per person, warm dry clothing in a dry bag in a hatch, extra food in addition to lunch, sunscreen, hat, rain gear, and an extra pair of shoes suitable for rough walking. Due to the inaccessibility, it is necessary for every paddler to be able to complete the 16 miles before dark, short of an emergency. It would be difficult to impossible to walk out and not a good place to spend the night. We will have an Emergency Initiator on top of the plateau in case we are delayed in the canyon, whose name and phone number will be added here and who will know how to contact emergency help. If weather forces postponement of this trip, we will try to do it on Monday February 25 or Tuesday February 26. Carry your passport with you if you have one, but at least a current government-issued ID. * Trip ratings are only a guide. Actual conditions will vary with wind and other weather. This is an ACA sanctioned event. All participants in ACA-insured activities must wear properly-fitting U.S. Coast Guard-approved lifejackets (Personal Flotation Devices, or PFDs) at all times during on-water activities. Non-HASK participants must sign a waiver. Waivers - Please complete our easy to use online waiver if you are a HASK member who has not signed a waiver within the last 12 months or a non- HASK participant. Read the waiver carefully. You give up substantial rights when you sign it. Add Smartwaiver with email address “noreply@smartwaiver.com” to your address book to ensure emails do not go to junk/spam. Select a link below to complete the online waiver. Respond to the “Confirm your E-Signature” email from ACA / HASK to confirm your email address. Wavier is now complete and valid. You will receive a confirmation email. Please download and print a copy of the waiver and bring it to the trip put-in. Guests – You are welcome to join us for a couple of paddle trips. HASK will cover the $5 ACA event membership for non-ACA members. Hopefully you will then join HASK and continue paddling with us.